Before we start, allow me to invite you to tomorrow’s yard sale! My new garage, which I share with a friend whose main interest is furniture, is already full of stuff and we need make room for new trash. This would be a good sale to attend because a lot of the former garbage hasn’t been in a yard sale yet, and much of it hasn’t even made it to the blog (though some of it will eventually, I plan on doing a bunch of photography today). If there’s anything you’d like to see at the sale, please let me know via email, Facebook, or blog comment and I can tell you if I still have it, if it’ll be there, or if I can bring it. The sale will be at the northwest corner of Laurier Park, on Mentana near the corner of St Gregoire. We’ll probably be ready for customers between 12-5pm, maybe a bit earlier or later depending. I’ve been going for more walks lately, in an effort to simultaneously relax and get more exercise. Of course, I also can’t help but notice what’s on the curb while I’m out there, and sometimes I’ll make some finds I wouldn’t have made otherwise. 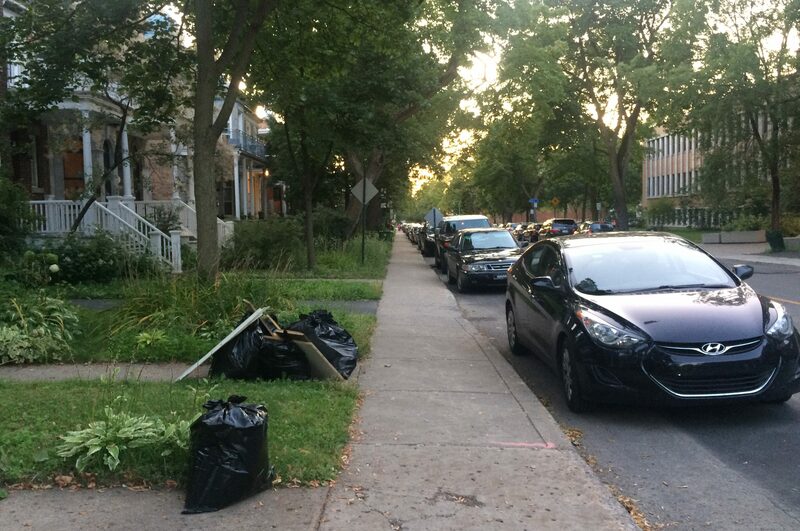 This little pile in Outremont provided a few interesting and unusual items. I haven’t seen anything there in the two subsequent garbage days however, so maybe the trash was the result of a one-off basement clean. Or, maybe I missed out on some good garbage in previous weeks. Who knows. As usual most of the best stuff was in the bags. The first thing I pulled out was a box full of coloured glass pieces (there’s more wrapped in the newspaper below). I don’t think they’re particularly valuable, but my friend thinks she can use them in art. I also found a fez. I’d never seen one in the trash before, so that’s a first. 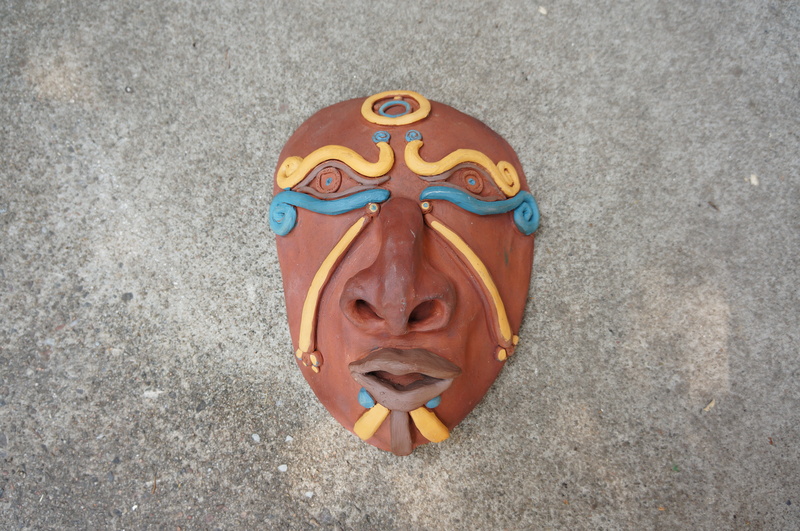 This clay mask was a bit unusual. I expect it was someone’s art project, but if you know anything about the style let me know. 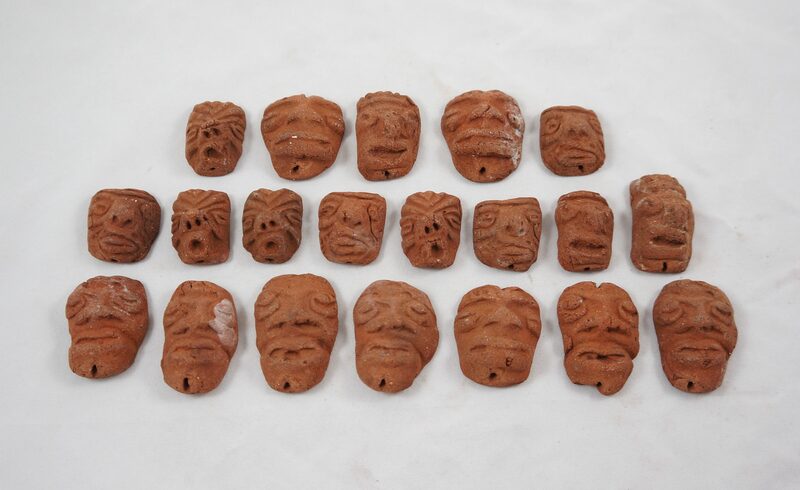 I also spotted a collection of much smaller faces. They look older and rougher than the larger one. If I were to guess I’d say that they were bought in a Colombian tourist shop back in the 50s, but really I have no idea of their origin. I’ve never seen anything quite like them. I found a bunch of tools, most of which look to be crochet or needlework related. Other than the crochet hooks I have no idea what most of these do, so please enlighten me in the comments! There was a little box with what I’m guessing are stone chess pieces inside. A couple of them have little chips, but I’m sure someone will be interested in them regardless. These were my favourite finds though, the little bits of jewelry I saved from the bottom of one of the bags. There’s a classic spoon ring, an Avon ring, and a broken Mexican silver ring. 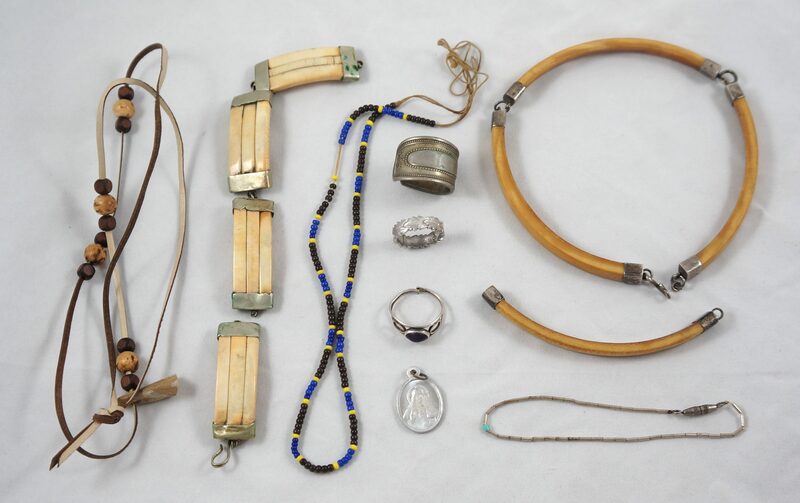 But the more intriguing pieces are the bracelet and the necklace on the right, both of which I’m pretty confident are elephant ivory. If so, I think this is the first time I find such a thing. Here’s a closeup of a section on the necklace, which appears to show the Schreger lines (the crosshatch pattern) typical of ivory. The necklace is unmarked, but I think the metal bits are sterling silver. One of the connecting rings is broken off, but I bet that’s an easy fix for a silversmith. I think both are pretty old. The necklace has an S-hook clasp, which I don’t think has been the style for quite some time now, and the ivory (if that’s indeed what is it) is very yellowed. Still, I don’t really know much about old ivory, so I’m hoping one of you can fill in the blanks! Ideally I’d like to know for sure whether or not they’re ivory, roughly how old they are, and where they might have came from. Regardless, this spot provided a lot of things I don’t often see. It should end up being a good learning experience. That’s all for now, but I hope to see some of you at my yard sale tomorrow! The tools might be for sculpting clay…just saying! Hi – about the tools – you have 3 possibly 4 latch hooks, for hooking rugs – they are the second from the left with the wooden handle , the two horizontal ones, white & orange & possibly the first on the left (I can’t see the hook clearly enough) .. The wooden item on the far right in your tools photo, is a sculpting tool. Wooden on far right might be a ” bone folder” … used to be made of bone, now wood to make a crisp fold in paper. 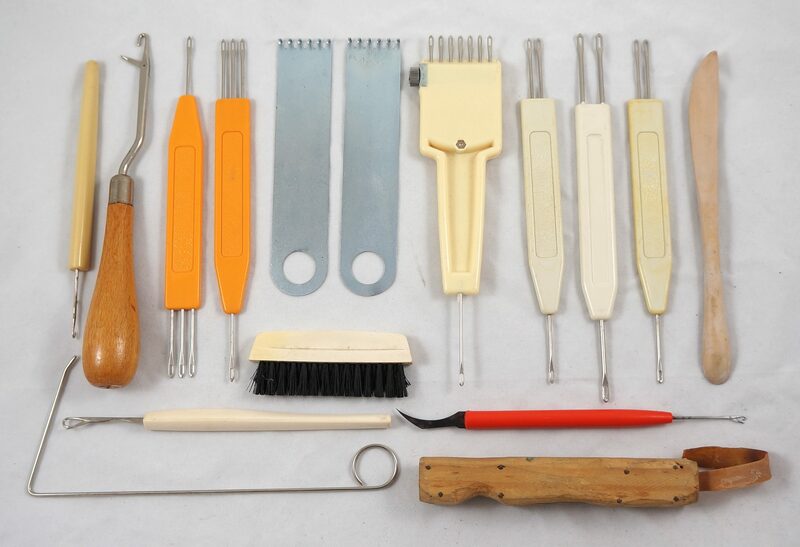 The tools with the cream and orange plastic handles are for use with a knitting machine. Antiques Roadshow has often featured ivory pieces. They suggest that because ivory is illegal to obtain now, one needs to know its provenance to legally sell it, i.e. the piece’s background, kind of like pedigree. Only ivory of a certain age, for example pre-1900, can still be sold. Of course, I’m sure many still do buy ivory informally. For myself, I can no longer legally replace the keys on my antique piano with real ivory. The synthetic stuff is fine and doesn’t yellow, so it’s no big deal. There are definitely some legality issues at play here (for good reason). For that reason I’m probably just going to stick it in a box somewhere until I meet an expert who knows about this kind of thing. 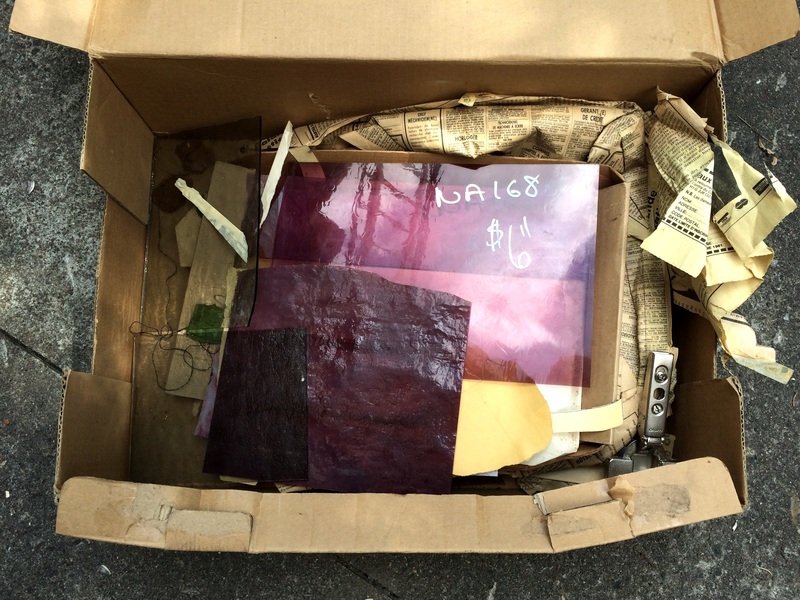 It doesn’t seem like it’s worth the hassle to trying to sell right now, but I don’t want to throw it in a yard sale box either. I have a set of those same stone chess pieces, so that’s definitely what those are! Ours has a very heavy stone board that goes along with it, too. 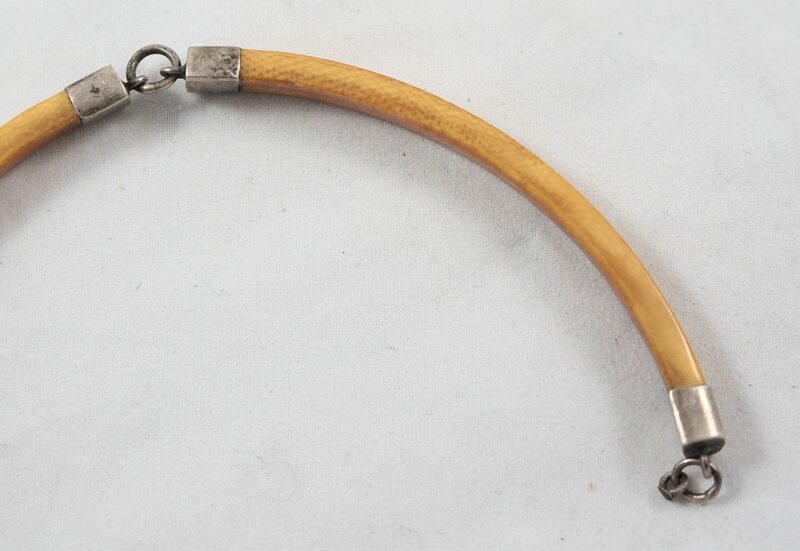 I’ve spent a half hour looking up ivory necklaces and have not found a single one with these kinds of long segments. Mostly, they are beads. Looks like you should hold on to this piece and research it well before selling! Also, looking at pictures of vintage or antique pieces, the ivory is much whiter. I guess they were cleaned or kept in a more proper environment. 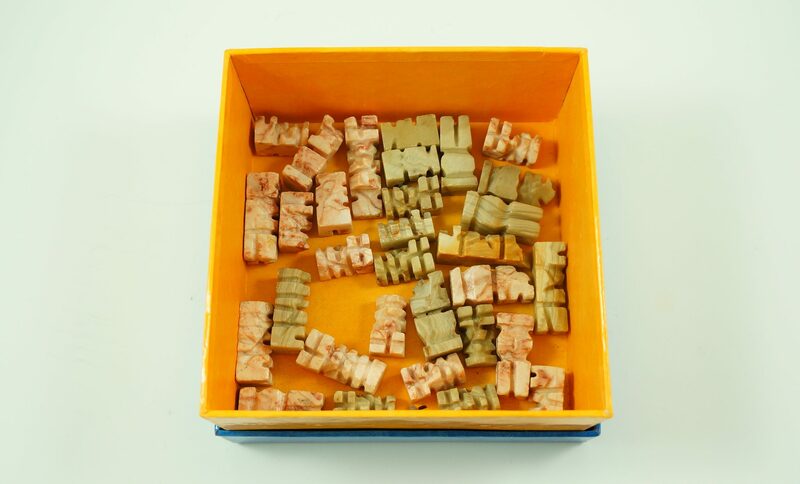 I was checking out whitening methods for ivory and there’s quite a range of them… some suggesting to do things others say will destroy the ivory. Basically, I feel this find requires a greater level of expertise than Google possesses. Good luck and hope it makes you a nice sum! Thanks for doing that research. I think there is a way to clean / whiten ivory, but I don’t think I’m going to do it myself. In all likelihood I think these will end up in one of my personal junk boxes, and if I happen to meet an expert at some point I’ll show it to them. 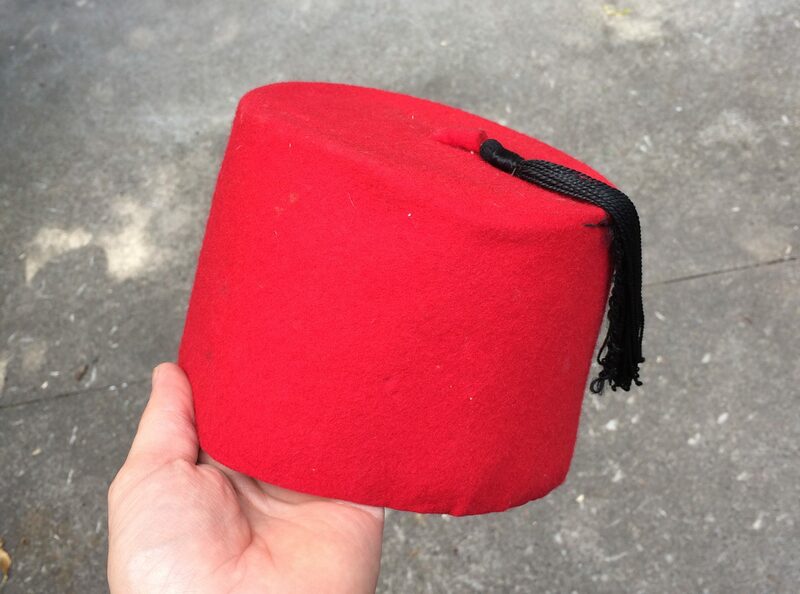 i would really like to know what the Fez goes for if you sell it. i have one i want to list but really have no idea. I don’t think they sell for much, unless you have one of the decked out Shriners ones, or unless it’s really old. I plan on throwing mine in the yard sale bin and seeing if I can get 2$ for it (it’s not in perfect condition either). FEZ ; 2 references ; 1) the shriners , 2) (& possibly better market) matt smith’s dr.who , “fez’s are cool ! ) 😉 the doctor rules for Loads of stuff ! Hi, just to let you know, most of the tools you show are for use on a knitting machine. The second tool from the left (wooden handle) is a latch hook for rug hooking.